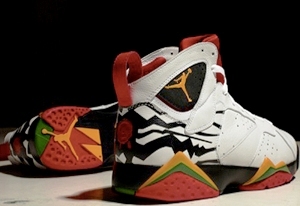 I am quite sure that you can still remember the original Air Jordan VII. Yes, you are right! It is the shoes that were released after Michael Jordan won his second title and a gold medal in the 1992 Olympics. Aiming to relieve the glory of those days, here comes a much-improved version of it, the Air Jordan 7 Retro Premio, and it is coming out on the market this 26 November. Like its predecessor, the design is still influenced by African art and tribalism, but it is much more enhanced with its new solid colours. And not only that, it is still as comfortable as the original one, and still light weight with its neoprene sock liner. Can’t wait to get it and wear one? Go and immediately grab one this Friday, because this edition is expected to be a hot item right after its release. Air Jordan 2 Retro QF Candy Pack is Out!